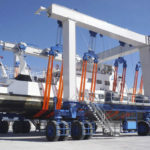 Mobile boat hoist is a unique and innovative marine lift used onshore or in the water to handle different tonnage vessels and yachts. According to different needs of customers, the mobile lifting hoist can perform varied functions, such as lift and move ships onshore for maintenance and repairing as well as arrange them in a specific order to save yard space. And also, it can be employed for the launching of newly built ships. The mobile boat hoists provide reasonable operating costs, flexible movement and high productivity for the operations of dockside. The boat hoist fabricated by our factory can handle a wide rang of ships and yachts from10 ton to 1200 ton. Based on the boat size, specific use and working environment, the mobile boat hoist can be customized for the optimal structure and performance. This boat hoist lift is employed in a variety of fields and occasions, such as shipyards, dockside, yacht clubs, water recreation center and navy to accomplish different lifting jobs safely and quickly. The structure of mobile boat hoist is simple but sturdy, mainly composed of U-shaped gantry frame, hydraulic system, boat lift winch, control system, slings, tires and so on. The articulated main beam and end beam allows the device to travel on uneven ground and reduces structural stress. 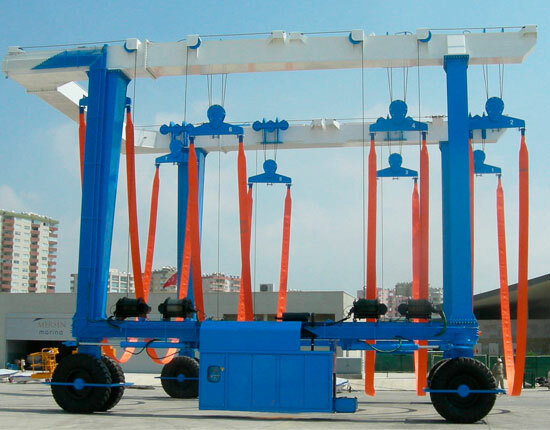 The width and length of boat lift hoist will be designed for your requirements. To know more about customized mobile boat hoist, contact us now! It performs multiple functions as you require. The boat lift provides stable and smooth movement. The use of soft and sturdy slings will avoid any damage to the delicate surface of vessels during hauling. In actual operation, the mobile boat hoist can place the boat in any designated area within the yard, and the device has the functions of fixed axle steering and 90 degree steering. In order to handle boats of different widths, the variable-span boat hoist can be designed for your needs. 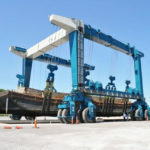 The mobile boat travel lift will significantly enhance production and operation of dockside. 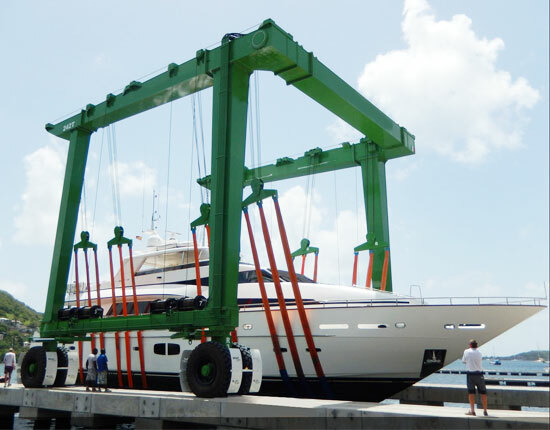 Typically, our mobile boat hoists can haul a boat or yacht up to 1200 tons. For heavier lifting requirements or special needs, the boat hoist will be custom designed and built. Here are some options for your reference. Power source: it normally adopts hydraulic drive. However, in the application of small tonnage boat handling, the electric drive system can be designed on request. 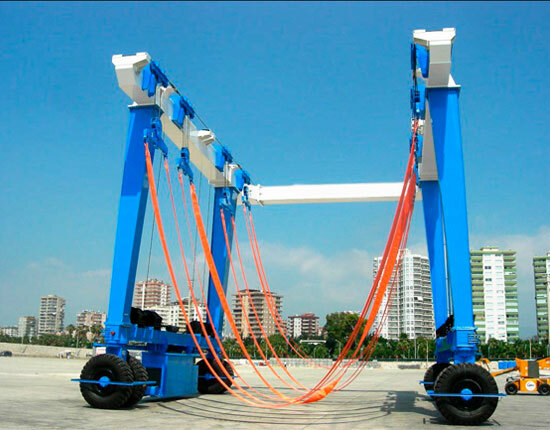 The hoisting mechanism of boat lift adopts a load-sensitive hydraulic system. Steering mode: there are fixed axle steering and 90 degree steering. It can drive with 4% maximum slope when fully loaded. The hydraulic steering system can be controlled by cylinder or turbine worm. Operation mode: remote control or cabin control. Generally, the remote control is found in small tonnage boat lift. For heavy duty lifting application such as 100 tons or more, it can be operated by remote control or cabin control. 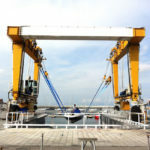 Variable span: based on the width of vessels, the mobile boat hoist can adjust the span freely. Movable lifting point: the distance between the lifting points can be adjusted to realize a synchronous lifting. 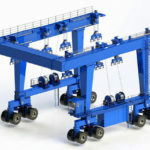 Other options include variable lifting stroke, the number of wheel groups and lifting points, variable lifting capacity. For further information, contact the sales manager directly. How Does A Mobile Boat Hoist Work? This boat handling equipment is capable of lifting a range of vessels in and out of the water. It can haul a boat up to 1200 tons. The adjustable slings are the units where the boat hull rests. This equipment operates on a specifically designed wharf by means of remote control, cabin control or the combination of these two methods. Remote control: it is a cost-effective option for small tonnage marine hoists like 25 ton, 50 ton and 75 ton. It allows you to operate the device remotely without touching it. At the same time, the boat lift remote control ensures a safe lifting operation. Cabin control: the heavy duty boat hoist is more often equipped with a cabin to control the device. Compared with remote control, it costs much more. Remote control + cabin control: in the operation of boat lift, these two modes can be used alternatively. With regard to mobile boat steering mechanism, the operation and steering modes vary widely. Generally there are straight travelling, oblique travelling, Ackermann steering, 90 degree steering and fixed axle steering, which provide flexible and convenient movement for boat hauling. The travelling and steering mechanisms will be configured for your requirements. To know more details, leave a message now! 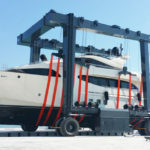 It is necessary to conduct a preventive maintenance in the use of yacht handling machine since efficiency and safety are key for material handling. Here is a checklist for your reference. Check the hydraulic oil level. Check the wire rope to make sure it is in good working condition. Inspect the travel lift slings. Check the boat lift tires condition. The inspection of these critical components should be done in a regular basis, such as daily before use, weekly, monthly and annually. Each part takes a different inspection cycle in the actual use. 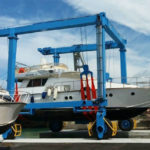 Why Choose Our Mobile Boat Hoist Lift? Ellsen is recognized as one of leading mobile boat hoist manufacturers and suppliers in China. Engaged in material handling industry for more than 10 years, we have a wealth of experience in the crane design, manufacturing, delivery, installation and maintenance. We supply an array of lifting equipment for your requirements, including overhead crane, gantry crane, jib crane, hoist, construction winch, marine winch and travel lift. We aim to solve any problem you have and offer you an affordable and powerful lifting solution. 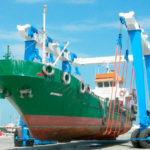 Looking for dependable mobile boat hoist provider? contact Ellsen now!